Nikki Beach Resort & Spa Dubai Dubai - is the first and original luxury beach club concept that combines the elements of music, dining, entertainment, fashion, film and art into one. Nikki Beach Hotels & Resorts operates innovative boutique and glamorous beach and urban hotels with unprecedented allure for the luxury traveller and jet-set global elite. Whether on the beach or at the heart of a bustling city, a Nikki Beach Hotel or Resort features an innovative and unique room experience along with gourmet world-class dining, extensive spa facilities, and signature day and night entertainment. Nikki Beach Dubai features cutting-edge architecture and design with the brand’s signature modern, all white décor, tribal influences and stylish ambiance. Nikki Beach Dubai pampers its guests with extravagant and plush sun beds, a unique menu filled with flavorful food, lavish parties, exceptional entertainment and stunning waterfront views of the Arabian Gulf. Nikki Beach Dubai offers globally-inspired cuisine, with the tastes and spices representative of all the countries Nikki Beach is located in across the world, including delicious salads, creative sushi rolls, original seafood entrees and slow-roasted free-range rotisserie chicken. Guests are able to enjoy Nikki Beach hospitality from day to night. Other offerings include an oversized leisure pool, swim-up bar, enclosed and open cabanas, ultimate VIP cabanas and 4-tier VIP terrace, among other amenities. A collection of 117 rooms and suites, as well as 15 ultra-deluxe villas and 63 lifestyle residence units, await the most discerning world travelers. This 5-star Dubai lifestyle beachfront resort features spectacular views over the Arabian Gulf and of the awe-inspiring Dubai skyline, with unique in-room features such as a bespoke entertainment wall, MyBar, mood light system and oversized bathrooms. Some will even benefit from private pools and decks. The resort offers refined cuisine in its five restaurants and lounges, as well as relaxation and fitness experiences at Nikki Spa and Tone Gym. Please note that Nikki Beach Pool and Beach Rules and Regulations do not allow guests below the age of 21 years to use the pool facilities. Additionally original identification must be presented upon arrival at the entrance, and we do accept mixed groups and couples only. 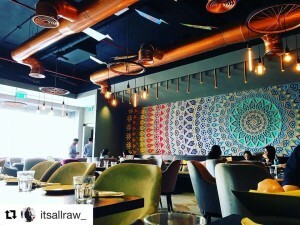 Contemporary style venue at Nikki Beach Resort & Spa Dubai introducing global, stylish bites and beverages. Featuring a three-dimensional ceiling, a long communal table that turns into a catwalk, entertainment space and a beautiful bar and terrace. Discover the simplicity of modern Asian comfort food at the resort’s hidden gem.